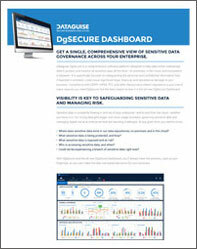 GET A SINGLE, COMPREHENSIVE VIEW OF SENSITIVE DATA GOVERNANCE ACROSS YOUR ENTERPRISE. Where does sensitive data exist in our data repositories, on premises and in the cloud? What sensitive data is being protected, and how? What sensitive data is exposed and at risk? Who is accessing sensitive data, and when? Are we experiencing a breach of sensitive data right now? With DgSecure and the all-new DgSecure Dashboard, you’ll always have the answers, right at your fingertips, so you can make the best risk-based decisions for your business.